This post for Road Trip Snack Boxes contains affiliate links. I make a small portion when these links are used, at no extra cost to you. Have a fun journey planned this summer? 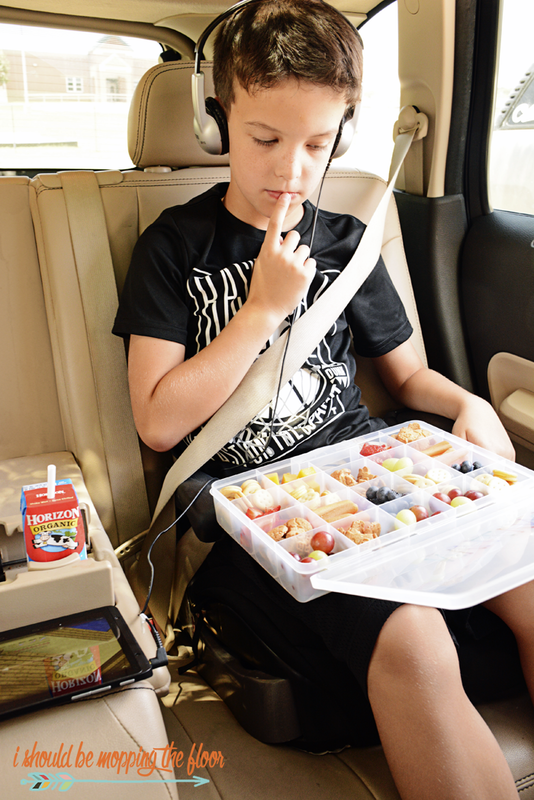 These easy Road Trip Snack Boxes are a great way to keep the kiddos fueled along the way. My husband grew up stopping in convenience stores on road trips...my family always packed a huge cooler for snacks. 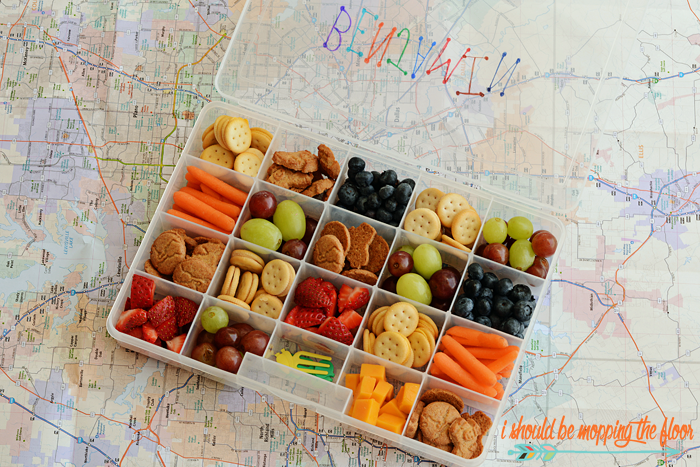 I think these fun road trip snack boxes are a great happy medium for our own road trips. Check out how easy these are to put together below. You can grab a similar box HERE on Amazon. My kids do pretty well on road trips...well, at least now they do (the baby years are a totally different story...ha!). Later this summer, my kids and I have a solo road trip to a conference I'm attending. 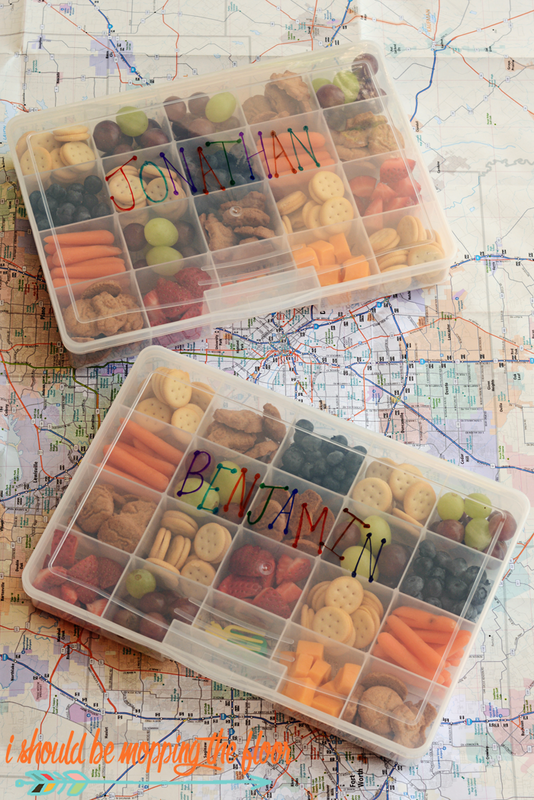 I'm excited to try out these fun road trip snack boxes. I saw something similar on Pinterest, but the link led to spam...so, if this is your original idea, be sure to tell me in the comments. I put my own spin on the box idea with our own snacks and using hobby boxes. These are designed for ongoing noshing all the way down the road. I do add cheese, but only because I know they'll totally eat it first (my youngest's first complete sentence was "I wuv cheese"). So, I don't worry about packing a cooler or anything like that (especially since I'll be the only adult on this trip...filling up a cooler is a pain). These smaller compartmentalized portions are fantastic for trips. The variety also keeps it fun and interesting. All of our Horizon favorites are perfect for road trips (if I can keep my husband out of them before we leave...ha!). 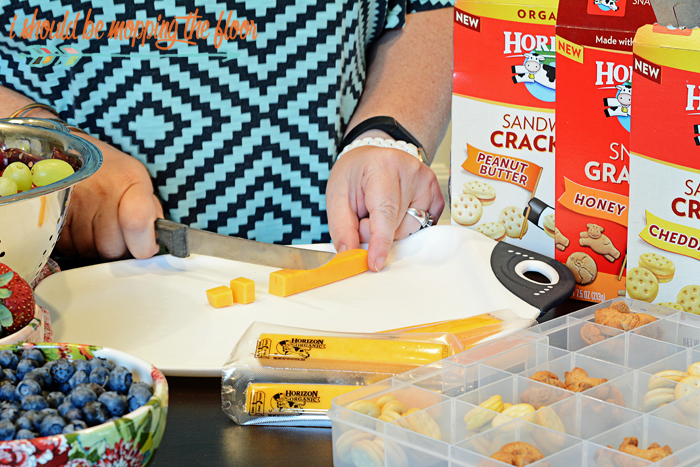 I also feel good about giving my kiddos these snacks...a lot better than a convenience store doughnut or candy bar that they may otherwise grab if we stopped along the way. 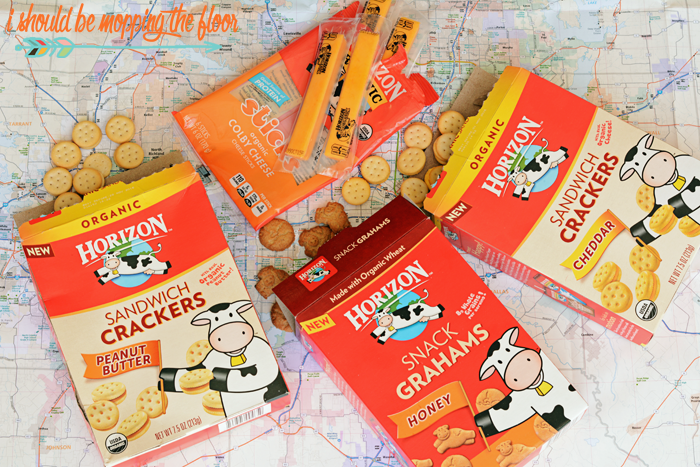 Both the Horizon Snack Grahams and the sandwich crackers are some of our absolute faves! I slice up the cheese sticks...one fits perfectly into one of the compartments. 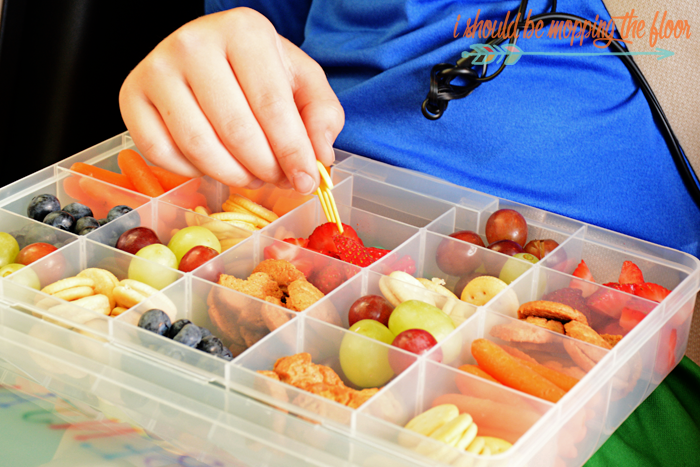 Then, I use all of the other snacks, along with fruit and veggies to fill the other compartments. These boxes go together really fast. This also eliminates the constant trash flow my back seat experiences on road trips...things don't always make it to the designated bag. Finding wrappers under the seat days (weeks?) later is always fun. Again, click here to purchase boxes like these on Amazon. I labeled them to make sure we didn't have the "Noooo, that's MINE" issue. It happens. I also included mini forks in them, too, for the berries. I've had these mini forks for years and use them in their school lunches. They're actually Bento forks...you can grab some HERE on Amazon. I've literally used the same exact set since my 6th grader was in kindergarten...they last forever! My kids are old enough to keep these with them on the trips...but for younger kiddos, they could easily be passed back and forth from the front seat. 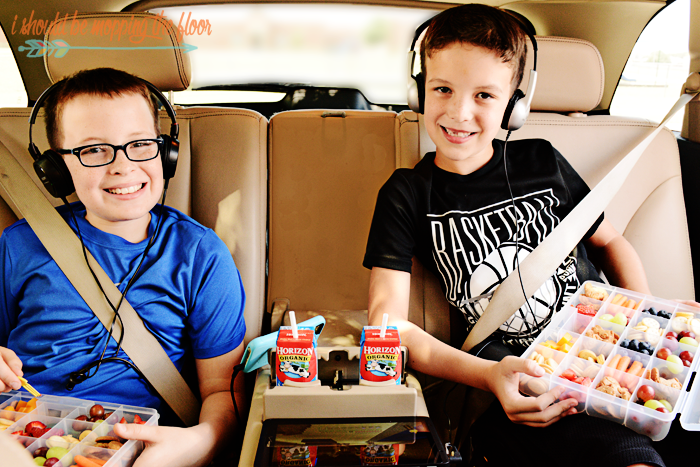 What kind of snacks do you pack for road trips? What a fantastic idea! My kids are under 5, so we may opt for a smaller box, but thanks for sharing! Great Idea! How do you keep them cool? To keep the cheese from melting and the fruit from wilting? These are great for the 3-5 hour trips for us. Inside the car, they stay fine (mine ALWAYS eat the cheese in the first 20 minutes...lol...so, I never have to worry about that!). Anymore than 3-5 hours and I'd probably bring a cooler for these to go in. But for that amount of time, the fruit stays fine for us. If you're worried, you can definitely pack a cooler! Thanks! That's a great idea. We have a road trip coming up next week actually. So cute! I love the mini forks too. It would make snacking feel like an activity. WOW! Those boxes are full! How fun! I need one of these. I could think of a million other things I could put into them too! What would be good way to make these airline friendly? That's a great question, Vonda. We fly a lot with our kiddos and I usually do something similar, but on a smaller scale that they can each fit in their backpacks...and not as much "messy" stuff like berries. I also include gum in those...for ear popping! :) As long as there are no liquids, these will be fine for security. thanks ma'am! I wouldn't have thought about gum! Awesome! Who can resist not trying out some goodies! What a great idea! We're going on a beach trip with my nieces and nephews. They would love these! Wish I would have seen this before our road trip last week but definitely for next time! This is brilliant and I am so using this idea. Thanks for sharing. I am at Realwholesome.co. Our little girl isn't quite old enough for this idea, but I'm pinning it to remember - I've already got the container sitting around with embroidery thread in it that I could "borrow" for this purpose! Awesome idea. Where can we buy similar boxes? I bought the boxes you linked to at Amazon and they are teeny tiny. The certainly don't fill my kids' laps like your do. The individual compartments aren't big enough to hold more than one or two grapes or one or two mini ritz sandwiches. They definitely couldn't hold more than one baby carrot diagonally! Can you give us the outside dimensions of your boxes so we've got a better idea what we are looking for? Thanks! Jen, I truly apologize. The links in the post were put there eons ago and the manufacturer on Amazon may have changed without my knowledge. I truly am sorry you went through the trouble. I'm deleting those links right now. The boxes we have are 9"x7". Thank you so much for letting me know this so I can get it fixed right away. Thank you bunches for stopping by!